You're going to be creating those t-shapes. This directly builds on the previous lesson, so you're also going to need to remember/know approximately where to place your dominant stripes. Remember that horizontally they go across the upper bust/upper back and vertically you can choose to have them coming down the bust/shoulder blade line or down your center front and back. Let's gander at the Jacket Front first. First you need to find the bust point. Usually on pattern pieces from the Big 4, they'll include that info on the pattern. Its almost looks like a bulls eye. However, if you're working with a pattern that did not include this info - shame on the pattern by the way - then let's figure out where that is. You'll need to get two measurements from your body. 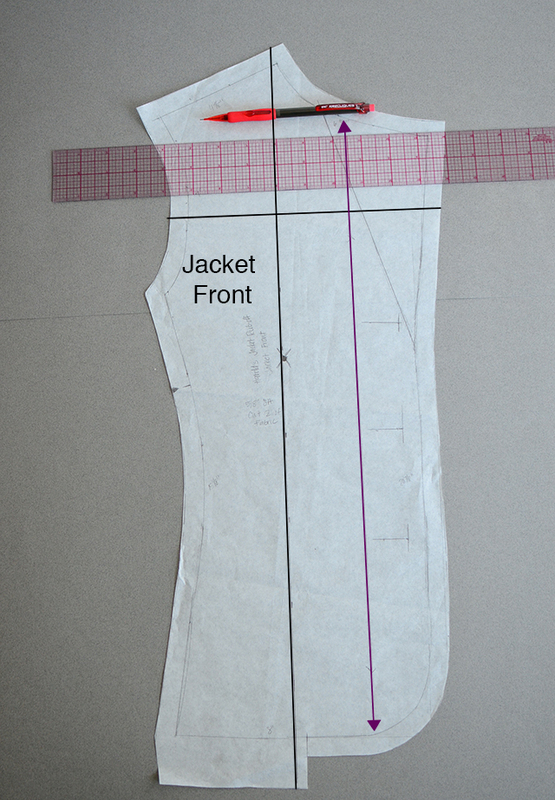 First measure from your shoulder point (the part where the sleeve connects to the bodice) to your bust point. Then measure from your center front over to your bust point. Now you'll mark the intersection of these two points on the pattern. First measure down from the shoulder point, diagonally to approximately where your bust point is. From there find the center front - again should be clearly marked on your pattern, but if not its usually the edge of the buttons, or zipper or closure. Measure over to your bust point. Mark the intersection and now you know where your bust point falls. This info is important because your first vertical plaid line is going to fall right over the bust. Now if you've opted to use the Center Front for your vertical dominant stripe, then follow the same direction, but do it over the Center Front of the pattern. To mark the vertical line, you're going to use the grainline as the reference point. Simply mark a line that is parallel to the grainline over the bust point. To find the horizontal plaid line, you need to know where your high bust falls. Measure down from your shoulder point to your high bust (I mark my high bust with an elastic tied around the area) and then cut that measurement in half. The horizontal line should fall about in about the middle of the armhole. 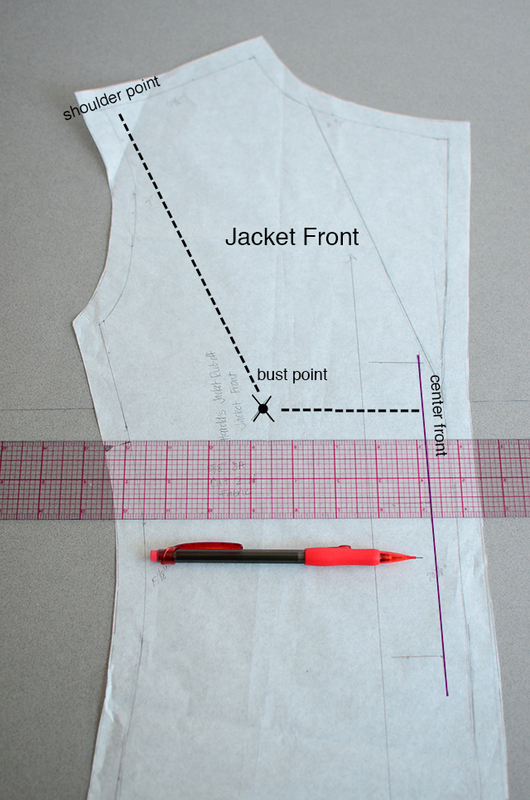 So to mark your pattern, simply measure down the half distance from your shoulder point to your high bust and mark a line that is perfectly perpendicular to your vertical plaid line. I love love love my 1/8" gridded ruler for this job - probably my most used sewing tool. Don't have one, get one! Yes! Moving onto the Jacket Back. You're going to use the Jacket Front as your reference. Match the shoulder seams and mark the vertical plaid line. 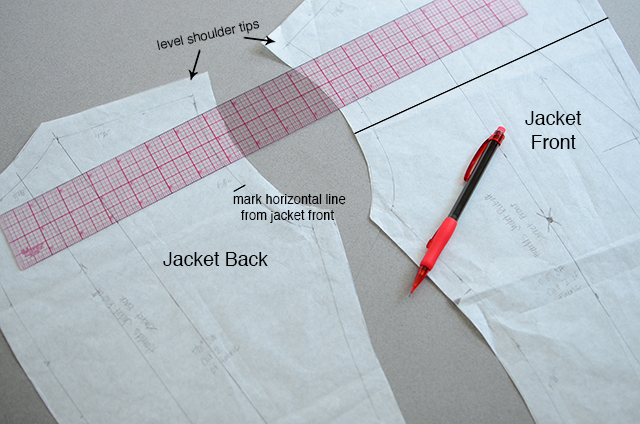 To get the horizontal line, lay your pattern pieces side by side, with shoulder tips level and mark the horizontal line from the front in approximately the same place. From there, extend the vertical and horizontal lines across the pattern in reference to the grainline. The vertical plaid line should be perfectly parallel to the grainline and the horizontal plaid line perfectly perpendicular to the the grainline. Upper sleeve is the same deal, with a minor exception. Its very possible the the plaid will not match at the back sleeve and in that case it is more important to match the front plaids. 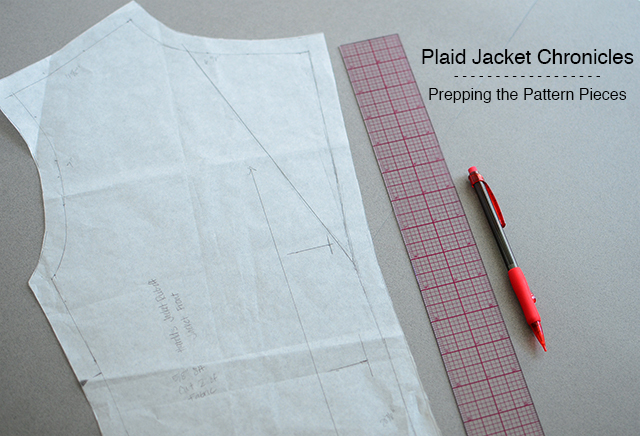 To get your horizontal plaid from the Jacket Front, you need to walk the seam lines. 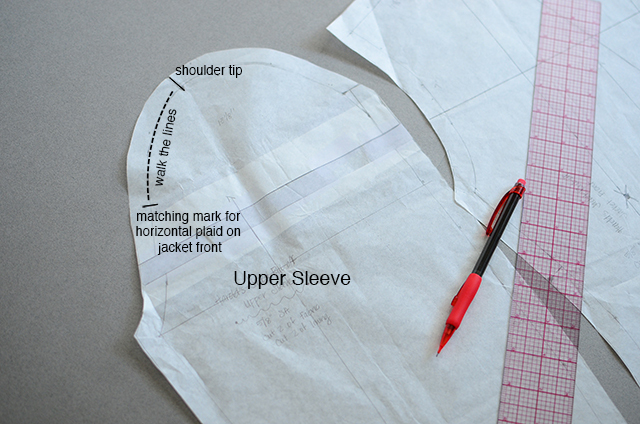 To walk walk seamlines, simply put the pattern pieces on top of each other like you're going to sew it. 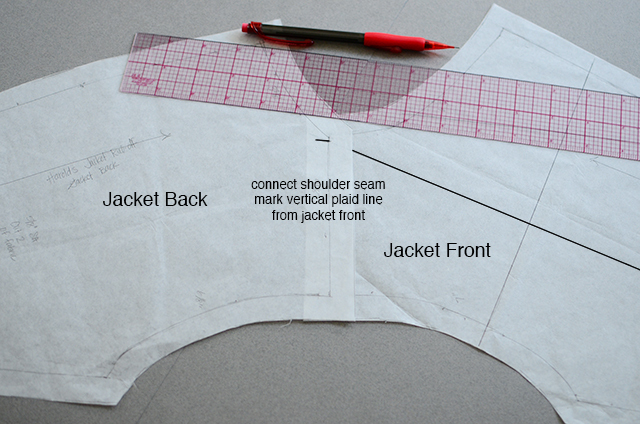 Start at the shoulder tip and walk the seamline from the tip of the sleeve to the horizontal plaid mark on the jacket front. Then you'll need to add about half of the sleeve cap ease. 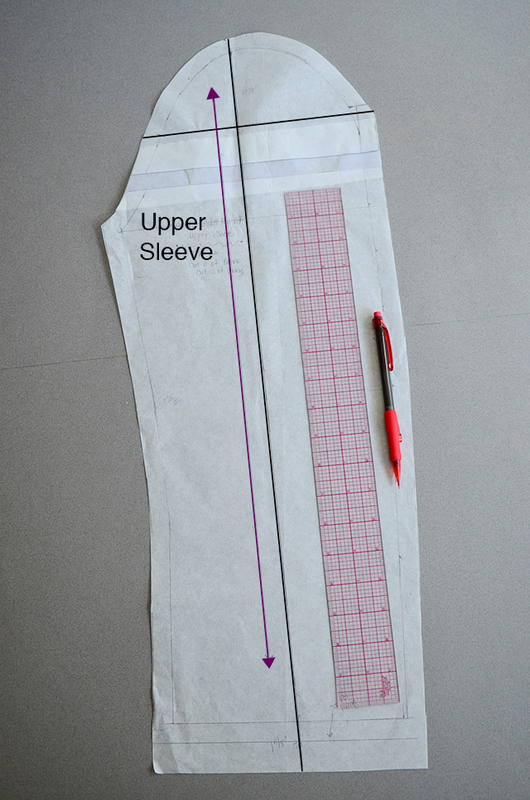 To find out how much sleeve cap ease you have, you need to measure the armhole and then measure your sleeve (both the upper and under) where it connects to the armhole at the seamline. 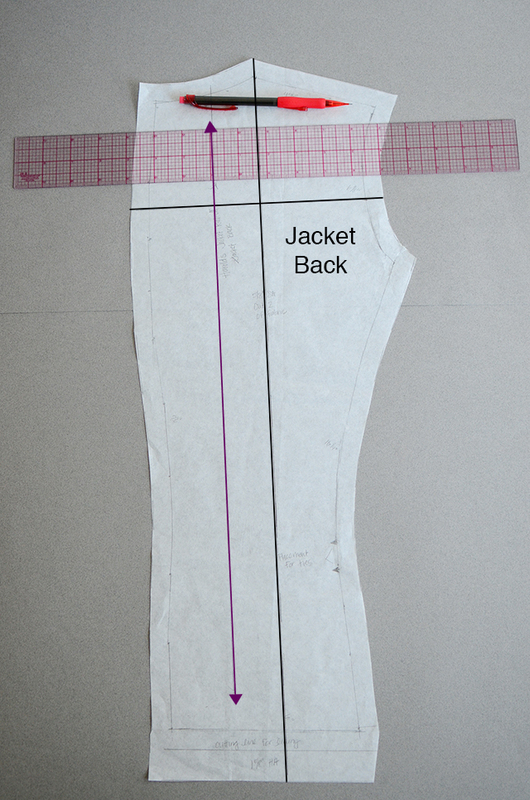 The sleeve will have a larger number and you subtract the armhole measurement from this and voila! you have how much sleeve cap ease is in the sleeve. Divide that number by 2 and relocate the horizontal plaid mark for the sleeve. Then, of course, mark the vertical and horizontal lines in your upper sleeve pattern. I like to put the dominant plaid down the center of the sleeve or at the shoulder tip. Again, the horizontal plaid line is perpendicular to the grainline and the vertical plaid line is parallel to the grainline. The other pieces will be cut based off of these three main pieces. I'll go over that in much more detail in the next post. I do hope this is clear. If it ain't, speak up! Also, do yourself a HUGE favor and reduce the sleeve cap ease on the sleeve piece on any of the Big 4 sewing patterns (sometimes other pattern companies have too much ease too, just check). I like to have 1.5" sleeve cap ease in jackets. You might like a little more or a little less. Usually there's something like 2 - 2.5" of sleeve cap ease in Big 4 patterns, sometimes more. Makes it impossible to put the sleeve in and they end up being uncomfortable and if reduced it also gives you a fighting chance with the plaid match-up. I have some black and white plaid shirting that I bought to make a shirt dress. Going on vacation soon but will be referring back to your plaid posts once I am ready to get started.I like the idea of visualizing T-shapes. This is very helpful. Thanks for the time you put into these posts. I completely agree. Doing sleeves is my absolute least favorite thing to do but if you're cutting thousands of jackets, it pays to do it. Only one, probably not worth it. For an enthusiast to spend endless hours reiterating to achieve a perfect match stripe is akin to a given homeowner to get a contractor's license to build their own simple back deck or get an accounting degree and CPA licensing in order to do bookkeeping for their one employee sized business. Pattern making is a profession like any other, it's why adept professionals make the big bucks (pattern makers are engineers; experienced ones earn twice as much as designers do if not more). Personally, I found it very interesting to see Sunni's process although it is not how I do it. However, if it works for her, it may work for you so what's not to like? Like she said, life is too short to invest in it for a one-off. @Kathleen - Thank you! I have loved your posts on sleeve cap ease, but yes, I know now that for an enthusiast - like myself - to achieve zero sleeve cap ease is really really hard. After you linked to that 400+ page dissertation, I knew I was way out of my league. It is the vocation of professionals like yourself and it does pay to perfect balance on a sleeve, especially when you can achieve that much desired plaid match both horizontally and vertically at the sleeve cap. What I have come to realize from your posts on sleeve cap ease is that its not a mortal sin to take some out, because most times too much has been put in the pre-made commercial patterns available today. Oh the heartache of sleeves!!!! I am itching to make a plaid something, but I am terrified of it! This series of posts are so incredibly helpful, I cannot stress that enough! Thank you sooooo much for this! AWESOME! Thanks so much for doing this! 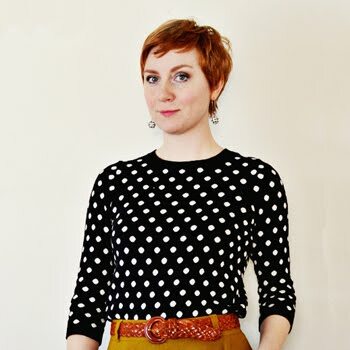 I love plaids, but have been completely mystified as to how to match them. I've never commented before, but I just wanted to say how much I appreciate your blog and all of the helpful information/inspiration you post here. Thanks! I am really grateful for your tutorials - they provide solid information about difficult aspects of sewing. Again a very interesting post on your blog. I like your videos as well. Thank you! Being a relative beginner I don't think I'll sew a plaid jacket in a while, but am learning much about what to do for a first non-plaid jacket. (like sleeve ease) Thank you for such a wonderful blog, Sunni. Being a novice, I haven't commented here before but must say your blog is always the FIRST I check for information on something and for new posts. You've just saved me a ton of time regarding sleeve cap ease. I've been thinking it was high time to tackle it prior to stumbling onto your links. Thank goodness I won't have to reinvent the wheel! It might not save my lace Macaron dress where I switched out sleeves with sad scary results. I have to see if I feel like unpicking the sleeves or not. . .but future projects will benefit!